Petal moulded rummer engraved with the motto Peace And Plenty within a simple oval dog tooth cartouche. The reverse with hops and barley. The motto Peace and Plenty is calling for times when peace would allow for full harvest to be gathered. The inverse of war and famine. 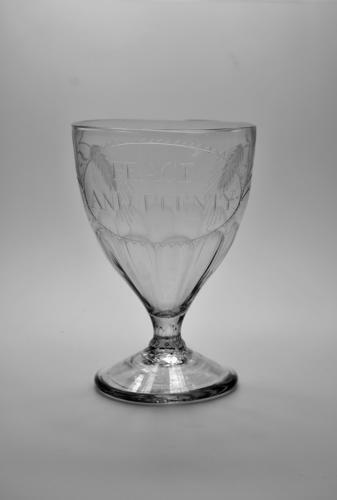 Illustrated in Rummers "A Social History Told in Glass" By Timothy Mills 2013, p. 114, Fig 104. Condition: Very good with no chips cracks or evidence of restoration.